With the new year underway, our staff here at Handguns is looking ahead to what 2015 has in store for the industry and for our readers. But before completely moving on, we'd like to wrap up 2014 by highlighting some our best stories. The articles presented below received the most traffic and comments out of all those posted over the course of 2014. You might also want to learn more or reexamine a story that's particularly interesting. There's a lot of misinformation out there when it comes to lasers designed for handguns. Find out nine of the most common misconceptions and their counterpoints. There are many great combat-inspired pistols on the market. See our picks for the 12 best. Finding a comfortable method of carry can be challenging for some and may even prevent individuals from carrying at all. Learn several solutions to common carry problems. Each year manufacturers introduce a host of new ammo offerings, and there were plenty in 2014. Check out the best new personal defense ammo from last year. 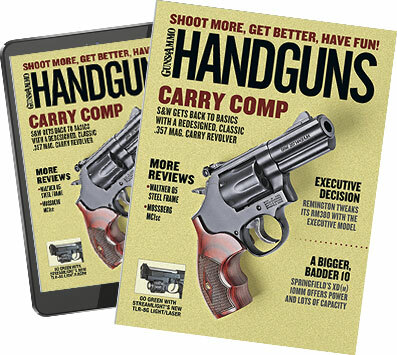 Long slide handguns have dominated the competition markets for some time, but there are a growing number of consumers buying them for target shooting and home defense as well. Read here to learn about 9 great long slide 9mms. Advances in technology continue to improve the quality and performance of defensive ammo offerings. Find out why today's modern self-defense ammo is better than ever. Trends in modern ammo technology are allowing smaller cartridges to deliver greater energy and expansion to their targets. The .380 is a capable round, despite some people's objections about its stopping power. Check out our list of the best .380s available now. It's essential to have the right belt when it comes to concealed carry. Check out our list of nine great concealed carry belts that will perform as needed. Semiautos are the most popular choice for many of today's shooters, but there are also some great revolvers on the market for self-defense purposes. Check out our list of some of the best self-defense revolvers available now. A whole new collection of carry guns was introduced in 2014. Find out what were some of the best new carry guns of the year.